As a local company D & B Electrical always gives Free expert advice ensuring that your electrical problems are solved quickly and thoroughly. With a wide range of expertise in Domestic, Commercial and Industrial work. Perhaps you are looking to have new components installed, something as little as a light replacing or a major project like a new fuse board, full or partial re-wires, installing new circuits or sub mains for your home or business. Whatever the task, we always provide the same professional and punctual service but most importantly all our work is carried out to the current 17th edition BS7671 regulations. We appreciate people work different hours and days, this is why we plan our work to fit round you. We can start early and work until late, weekends are also not a problem. We pride ourselves on offering the latest technology in LED lighting systems. All our electricians are fully qualified and fully insured. All work guaranteed for twelve months and LED fittings and lamps guaranteed for two years. 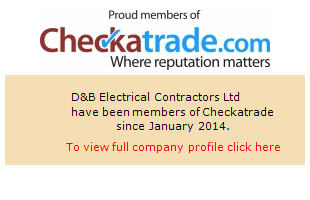 We are now proud members of Elecsa & checkatrade you can find us on the Electrical Safety Council Register. We are very proud to be training your future Electricians with a new apprentice on board. Contact us for FREE advice or a no obligation quotation.